One tool we love to use when teaching children about different habitats is a diorama. This craft focuses on the desert and which creatures and plant life you are likely to find there. 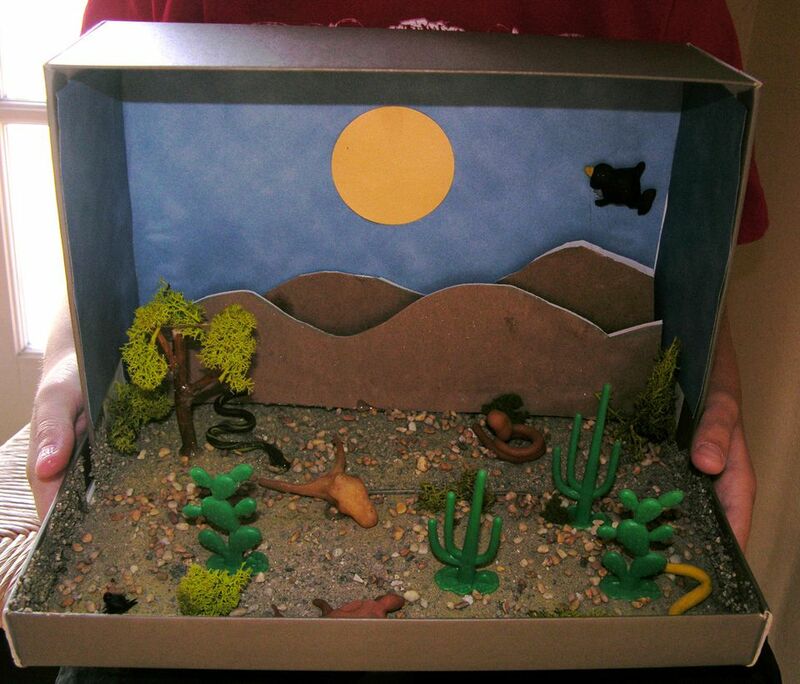 This desert diorama craft can be modified to match the abilities of children both young and old. Pick out a shoebox that is large enough for children to create a fun desert scene. If you don't have a shoebox, you can use a large cereal box instead. Remove the lid from the shoebox, and lay it flat in front of you. Now, turn your shoebox on its side, and set it inside the lid. The open side of the shoebox should be facing you, and the lid should still have room for you to use as the desert floor. You can glue the shoebox in place if it isn't snug and staying put. Paint the bottom of your shoebox and lid with acrylic paint that is the same color as desert sand. Wait for the paint to dry. Mix 3 tablespoons of school glue with 3 tablespoons of water. Apply this mixture over the bottom of the shoebox. Immediately sprinkle sand on top. Set aside until the glue mixture dries, securing the sand in place. I live near the beach, so it is easy for me to grab some sand for my projects. If you don't have a beach nearby, you'll want to purchase some sand from a craft store. Paint the ceiling and the sides of the shoebox with paint that is similar to a sky blue color. Continue after the paint has had time to dry. Cut a few sand dunes out of brown or sand colored construction paper, and glue them to the sides of your shoebox. Now it's time to add desert animals and plant life to your diorama. At this point, you can decide if you want to create a general desert diorama or select a specific desert to mimic. Possible deserts include the Sahara Desert, the Mojave Desert, or the Kalahari Desert. Your plants and animals can be made out of clay, or you can cut them out of magazines. You can also purchase miniatures or print images from the web. Hang any desert birds from the ceiling of the shoebox. You can use a piece of yarn to do this. You'll need to glue the other animals and plants to the shoebox wherever you think they look best. Finish your desert habitat by adding any other items that someone might find in the desert. For example, you could add a model of a Sphinx or the carcass of a dead animal. Wait for the glue to dry before displaying the desert habitat diorama for all to see. Always cover your workspace area with old newspaper sheets or a piece of plastic. We like to use shower curtain liners purchased from my local dollar store, but any large piece of plastic will do. Hang the desert birds at different lengths so that the birds appear to be flying at different heights. Common desert plants include yucca plants, cacti, pin cushions, Joshua trees, agave plants, devils fingers, fish hooks, prickly pear cacti, fairy dusters, buckhorns, and staghorns. Common desert animals include camels, snakes, meerkats, lizards, jackrabbits, coyotes, sand rats, and cactus wrens.